Research on how and when birds collide with buildings could inform future construction plans. Dead birds might be the last thing you would think of collecting, but they were the target of a recent campus-based research initiative. This October, six undergraduate students and one professor spent 21 consecutive days searching for newly deceased birds that have crashed into campus buildings. “Window strikes are pretty common. They can survive, but it depends on how fast they’re going,” says project leader John Withey, an assistant professor of biology. A victim brought to him recently was an ovenbird, a warbler with black speckles on a white chest that commonly winters in Florida. Withey is excited that his undergraduate students were able to participate in gathering data for the continent-wide, scientific study of bird-window collisions. FIU joined more than 20 institutions across North America in the new study, based at Augustana College in Illinois, as the only participating university southeast of the Appalachian Mountains. This hands-on project reflects Withey’s approach to teaching and research since arriving at FIU in 2012. He organizes his classes and laboratory to enable discoveries in a manner similar to his experience as a student in California and Washington. “That’s what I value–giving back the opportunities that I had,” he says. Withey mentors and inspires FIU’s young scientists through the rigors of precise ecological fieldwork and data analysis. One new opportunity this semester was the course on urban ecology, which incorporates his love of birds. “When you’re personally involved, there’s more of a spark,” he notes. Withey says this nascent, interdisciplinary field offers a vital looking glass into the future of an increasingly urbanized world that remains dependent on natural systems. Miami offers an exceptional real-world laboratory for investigating the interaction of hundreds of bird species within a densely built environment. Withey has published widely on urban ecology and avian research. He recently traveled to Colorado to discuss how birds interact with differing patches of hardwood hammock in southern Florida. Using statistical analysis, the research is finding that residential birds engage differently than migratory birds with the remnants of this declining habitat. “We don’t know that much about the habitat’s quality. Are birds finding what they need?” he asks. In another study, published this year in the Proceedings of the National Academy of Sciences, Withey and co-authors found that birds previously categorized as vulnerable were impacted more by urbanization and agricultural expansion than other groups of vertebrates. Huge conversions of natural land are straining ecosystems globally and locally. Withey challenges his urban ecology students to invent ways for cities and nature to coexist. More than 80 percent of the U.S. population lives in cities, and the greater Miami region is one of the densest and largest, ranking number eight in the U.S., according to the U.S. Census. Neighborhood parks that could support birds are conspicuously absent in Miami-Dade County, and its two largest cities, Miami and Hialeah, rank among the nation’s three worst for green space, according to a 2014 report form the Trust for Public Land. 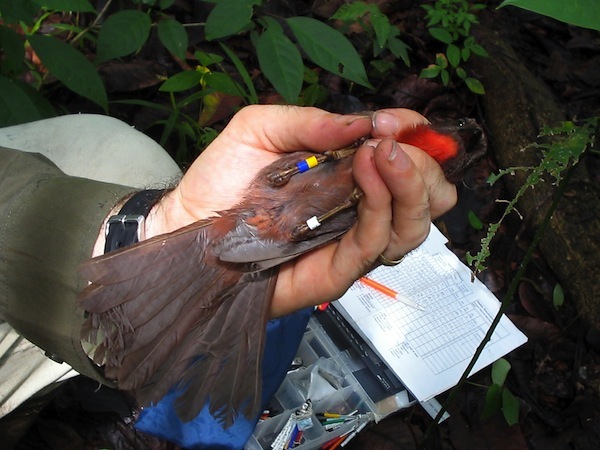 Withey spent 18 months with the Smithsonian Tropical Research Institute intensely studying songbirds and their preferred habitats in Panama, and the results appeared last year in a single-authored paper in the journal Biological Conservation. Twenty years ago in Panama, he taught environmental awareness with the Peace Corps. Panamanian textiles and a wood painting of a motmot, one of Withey’s favorite bird species, adorn his office walls. Withey says that Florida residents can support birds locally by adding native and fruiting plants to yards, keeping cats indoors, and adding stickers of hawks to windows. In future years, Withey plans for the window-collision study to expand beyond collecting dead birds and into an experiment of preventive window treatments. Getting the broader community involved in citizen science is also on Withey’s agenda, and every year he conducts birdwatching sessions during “Environmental Immersion” days at Fairchild Tropical Botanic Garden. In another planned project, local bird watchers will help Withey identify individual ovenbirds based on his multicolored tags. With cooler weather approaching, more migratory birds will be flying through FIU, and Withey and his students will be counting the ones that did not make it, with the intention that advancements from such research will create a better future for both humans and birds. Maybe we can find a way to fly, together.